To continue, we cross the waters of the southern sea to the other part of the North, North-Holland. Holland btw is not the name of the Netherlands, it is one of the provinces. there are two, north- and south- holland. North Holland was doing pretty well too judging from the abundance of gold jewellery. 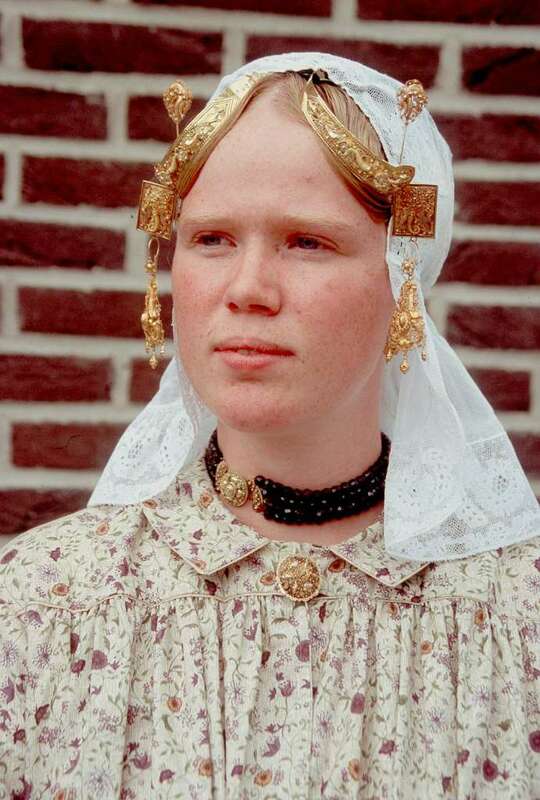 The thing on the lady’s forehead is called a ”forehead-needle” and it was worn in Groningen and Friesland also. Sometimes made of gold, with very delicate and intricate decoration, or made of silver with diamonds. Young girl. All this jewellery was only for special occasions and for church going. 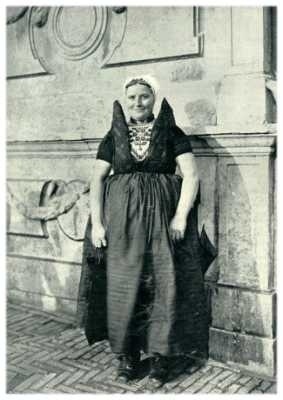 Check out the necklace: These are the traditional necklaces worn in The Netherlands, made either of Coral, or out of Garnets. Always with a large gold lock. The lock is worn in front. if it is in the middle it means the lady is married, to the left: she is engaged, to the right she is still available! 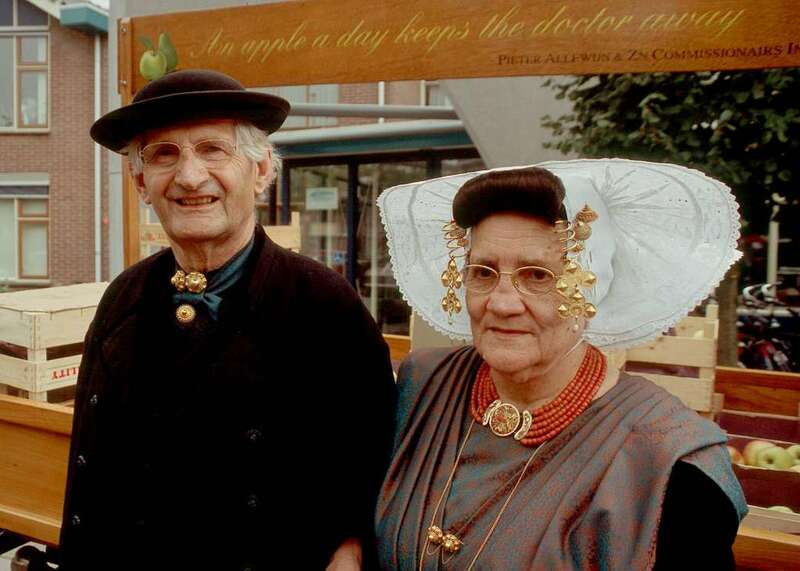 The lady to the right wears her cap with an ear-iron, (a very small one in Huizen) the one to the left without. 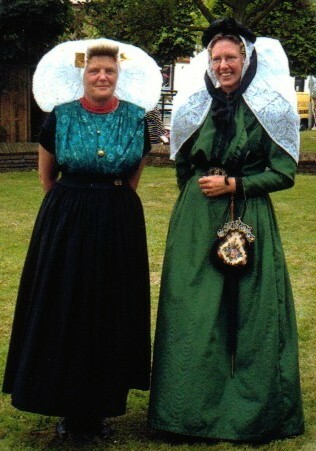 Now for those who have seen some Dutch promotions, all these costumes must seem very strange. 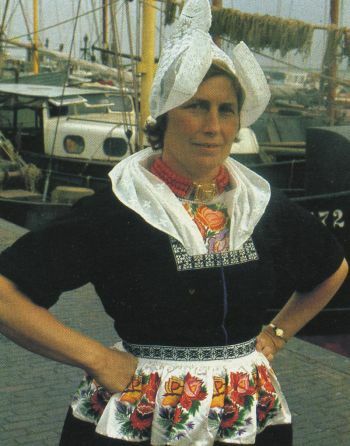 That is because; when the tourists are presented with dutch costumes, they always get to see the costumes from a few fishing villages around the former Southern sea. 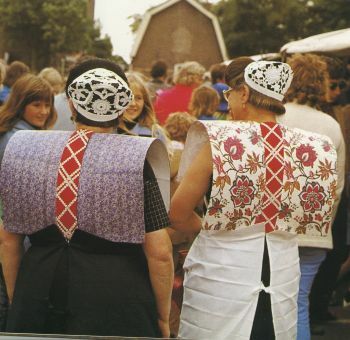 In the middle of the Netherlands, going a bit to the south-west, we have the Dutch ”Bible-belt” As far as I know the only region where (especially women) still wear the regional dress daily. That is because of the fundamentalist Christian mentality. These people also don’t inoculate their children because it’s ”all in the hands of God” Thereby forming a real danger to themselves, and the rest of the Netherlands if ever we get a dangerous epidemic disease going about. In my early childhood there was a polio epidemic and many children died, or became stuck as invalids, because of their parents refusing to let them be inoculated. We just had a minor outbreak of a very unpleasant but not deadly disease amongst these people. I think God has given us brains and made us capable of developing medicines (and supplying the ingredients) as his/her way of helping us to combat disease. Of course a real caring God might not have placed all these diseases around us in the first place, but I’m getting needlessly metaphysical here. Anyway, religious bigotry is the best way of preserving ancient customs, so I have some nice images of the typical Staphorster fashions to show. One very tipical way of decorating is the use of little coloured spots, on everything. Ladies getting ready to represent Staphorst on the queen’s birthday. The lady in blue is in mourning. 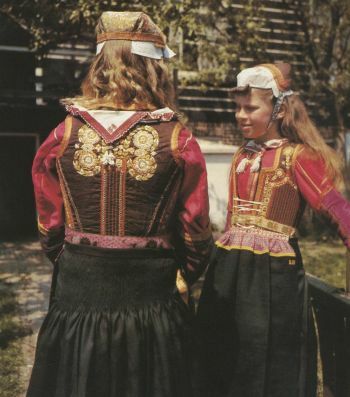 Two girls in traditional dress. 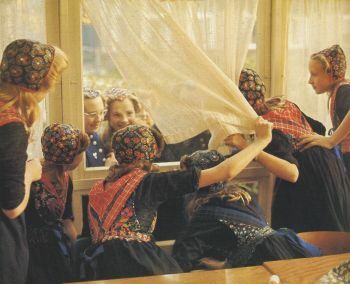 The little girls at the bottom wear a ”nette” in winter, a cap with an astrakan border, and the hair is then brushed over it, and being held with an elastic band. 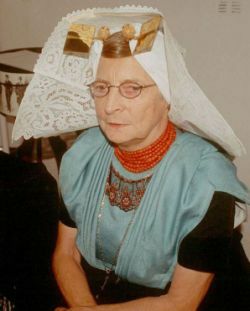 The lady to the right is dressed for church, with a lace cap over the ear-iron, and a bible with silver lock and decorations and a carrying chain. 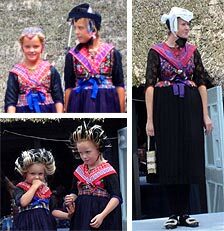 Ladies from Marken in full-dress wearing their ”Kraplappen” stiffened squares of ancient and expensive fabrics. The lady on the left is in mourning, blue and purple are mourning colours, the lady on the right is wearing what looks like an eighteenth century ”Sits”. A handpainted silk from India. Right , to the next bit, we move down towards the islands at the bottom left on the map. a Province known as Zeeland. (guess what: sea-land) Lots of bits of land surrounded by sea. 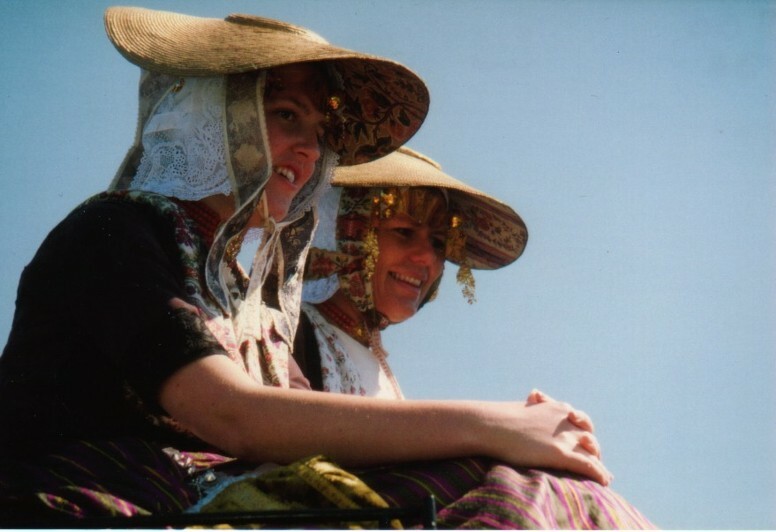 On special days (and with no strong winds blowing) ladies wear an enormous shell like lace cap. The form of the cap tells you if she is a Protestant or Catholic. 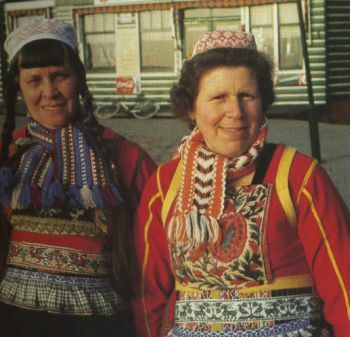 But all the islands have their own take on dress, Apparently traditional dress is still very much alive in different Folk-societys; I found a lot of good pictures! For really splashing out one can hang pendants, called ”bellen” on the spirals. They are triangular in shape with pearls hanging at the bottom. One island, called ”the land of Axel” has been very isolated it the past, and the costume had evolved in a fairly spectacular manner. Isn’t that interesting? Like wildlife on an isolated island in the pacific, only here it is costume. look at the folded material of the other ladies in the photos above, and see what happend to that bit in the land of Axel! the beautiful beaded decoration is called a ”beuk” and they are made using antique beads, by the ladies themselves. 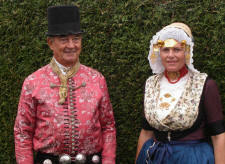 Modern folks wearing the traditional Axel dress. This is it. And, believe it or not, I haven’t covered all! There are more! But I’m stopping now. 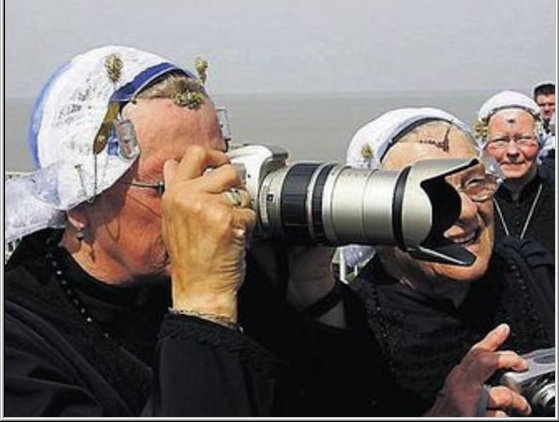 It looks very amusing seeing the lady in old time clothing using a Hi tech camera…. Those damned Muslim fundamentalists! Time for them to go back where they came from, forcing their women to cover. Imagine that. 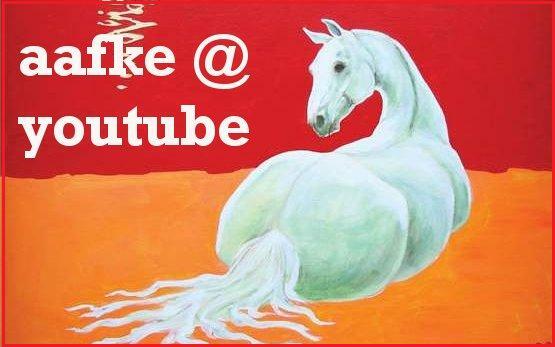 This is an incrediable post and I would thoroughly enjoy seeing and learning more! I am struck by the variation in the costumes and head covers. Not only the materials but the designs are dramatically different one from the other. Some of that head gear appears rather uncomfortable, or awkward in the least. I don’t suppose ladies spend any time in the kitchen wearing all those protrusions. Blue and purple are mourning colors? That’s interesting. Those are my favorite colors! I like the custom of signifying mourning with a certain bit of color or clothing. Now that I’ve experienced a profound loss, I can appreciate how a person might want to be given wide berth and special consideration whle in that state. 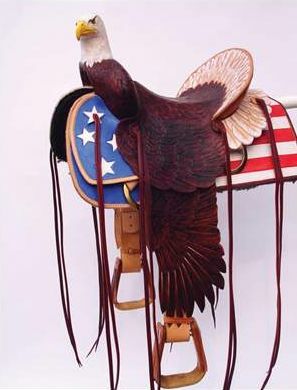 Here in America, all the focus is on youth, health and vitality, as if old age and death were afflictions from history. Do you wear, or have you worn, any of these outfits? We would definately like to see a photo of that, but I don’t think we will. In any event, thanks for the cultural overview of hijab Holland style! It is interesting how a dress or head cover is used to specify area of residence, religious affiliation, marital status , social status etc.. It is like wearing an ID card ! Tasman: yep, I really like that photo! AbuSinan, well it’s those damned Cristian fundamentalists in this case 😉 Only last year they reluctantly give women the opportunity to have leading roles in the most fundamentalist Christian political party, and if you ask me, only because otherwise they would lose their status as political party for the tax-people. Go figure. And go figure how loooong it takes for the ”modern” dutch to do something about it! However, all these costumes are hardly worn anymore in daily life. Marahm: People only dress up like this for special holydays now. And these are the ”party” versions. When you go out in your ”sunday-best”. In daily life the costumes were a lot less elaborate. 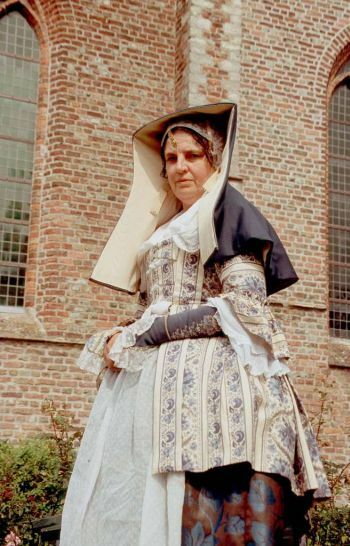 But in the case of more oldfashioned costumes (some still sixteenth century in construction) they still were very cumbersome and seems like a drag to put them on. And most of these costumes are stuck together with needles, no safety needles, no, real needles and pins! There is a definite purpose in wearing mourning. I just looked pathetic in old grubby clothes for years. Because I couldn’t be bothered and wasn’t interested in wearing something nice. I have a photo of me in nineteenth century fashion dress, I’ll look it up. Its so interesting really. I wonder how that designer could create this kind of hats women wear. I mean those big ones. And those clothes which look like fantasy fashion show. That sign for girls to be married, engaged or available is also very interesting. In Iran its just ring finger which shows a girl is married/ engaged or available. Also alittle group of iranian girls leave alittle hair in the space of between their eyebrows, so people will know they’re not married. But most time you can not notice who is married or who is not. 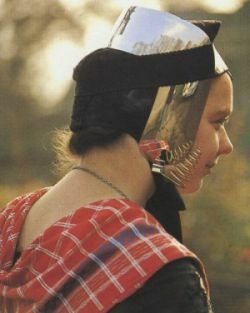 Untill you ask them..
I’ve got to say that Holland women sport some of the most unusual headgear I have ever seen!!! Some of them remind me of the Flying Nun (remember that TV show? ), and some look like they are ready for outer space travel. How fascinating! Wow! 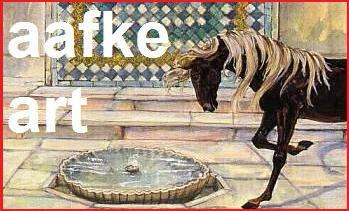 This was an amazing post – great job again, Aafke. 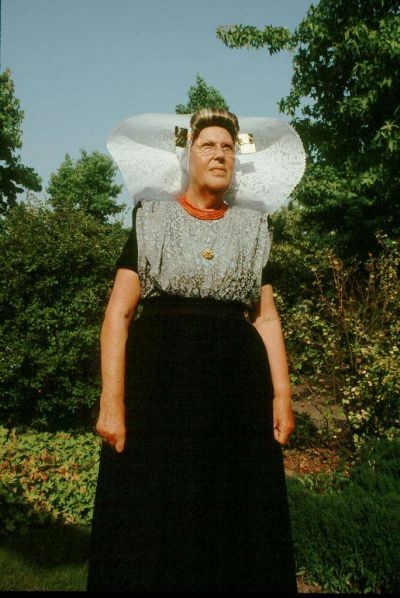 I remeber the Flying Nun. 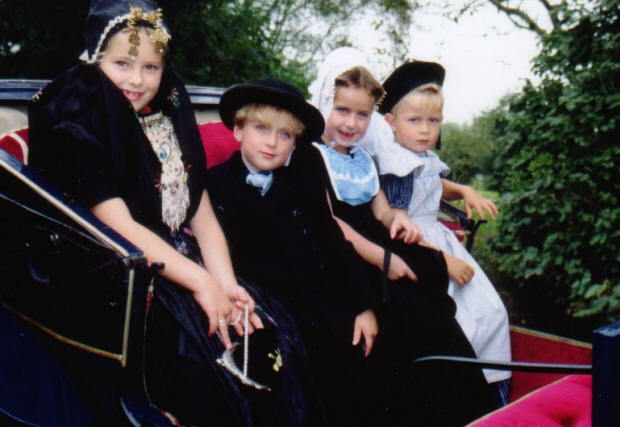 remember this mode of dress is considerred archaic in The Netherlands and only people, which we would consider, our Bible Belt still wear these clothes. One thing Aafke didn’t show is how the men dress, is completely awfull and boring. 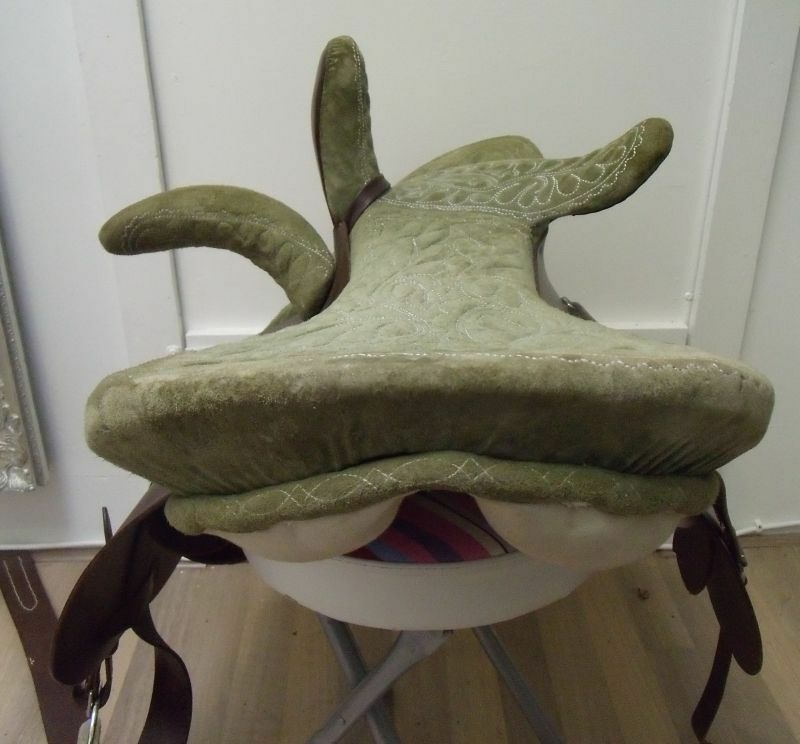 I’m not sure how comfortable the clothing is, and I don’t want to find out…. Shahrzad, that is very interesting. Everybody, or those that haven’t read the post, nobody wears these anymore, only for special occasions. And to avoid the flying nun issue: never with strong winds blowing! Very beautiful! 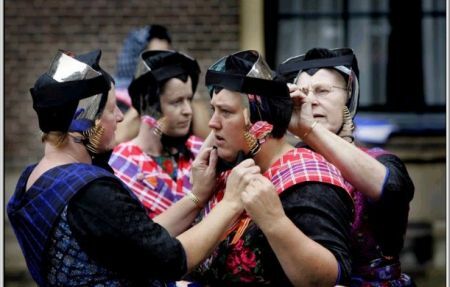 I must say I am thrilled to see this side of Dutch women. They look so fresh and pure. LOL… I do enjoy the photographs and education! And all this time I thought it was all about wooden shoes! Lofter is right. I was waiting to see wooden shoes too. Do you remember stories of childhood? I used to imagine them like this and draw those story characters with kinds of clothes.. Reminds me of “Heidi” character. or “Hansel and Gretel”.. or Hans Christian Andersen’s stories.. He was danish though..
Pfff, ok, posted on wooden shoes. I só promised myself not to write about wooden clogs! I suppose the next thing you’ll ask for is windmills and cannabis? A post about cannabis ? Oh yes, definitely. pleease! and here I thought polyester hijabs were uncomfortable! But the really large ones are only worn on windless days! Thank you for the great photos! 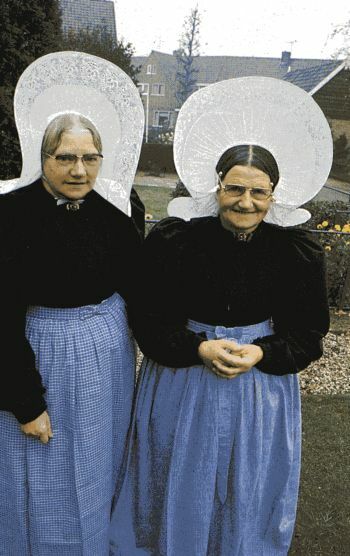 I happen to come from a Dutch town in the Midwest and I craft these intricate costumes to be worn for tourists during the annual May Tulip Festival. 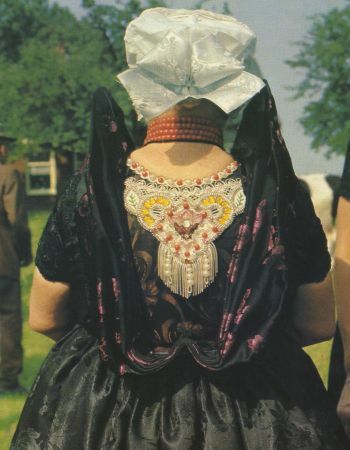 They are difficult to construct but so lovely and striking when worn with all the gold finery (and most often a pair of klompen (wooden shoes)).